Cross-posted on my wife's blog, Adventures of a Costumer. Yesterday's post recounted what we know about how William T. Clark left his family's farm near Chestnut Level, Drumore Township, Lancaster County, to join Col. Hambright's regiment in Lancaster on September 12, 1861. That very same day less than a mile away in Chestnut Level village, a daughter was born to Edwin and Margaret Shoemaker, and they named her Anne Kensel. Fifteen years later in 1876, Annie's uncle presented her with an album, which she filled (or he had filled for her) with twenty-seven family photographs from the 1860s. Over 130 years later, the album was listed on Ebay, and I purchased it as a Christmas present for my girlfriend (now wife). I didn't really know what I was getting, but it has turned out to be a very interesting photographic documentation of an extended Quaker family in southern Lancaster County. The album contains photos of many of Annie's parents, grandparents, aunts, uncles, cousins, and other family members--Shoemakers, Kents, Boltons, Lamborns, Kensels, Smiths--most of whom lived near Liberty Square, another Drumore Township village just west of Chestnut Level. Some were even very close neighbors of William T. Clark. Almost all were buried at the Drumore Friends Meeting cemetery in Liberty Square. I haven't mapped out the genealogical connections explicitly, but cursory research makes it pretty easy to jump from one person to another through siblings, children, and marriages. 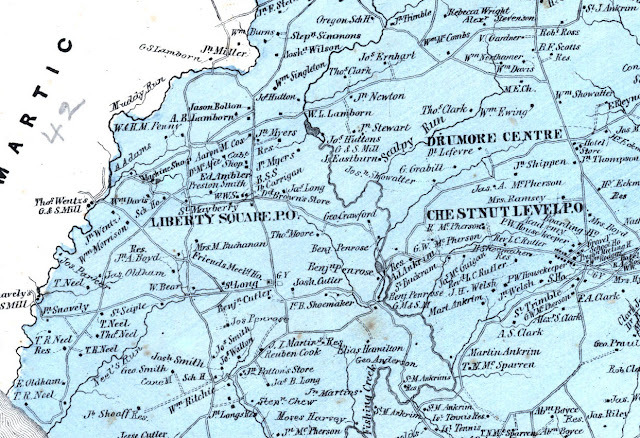 Detail of Drumore Township map of Bridgens 1864 Atlas. Many of the people pictured in the album lived on farms denoted on this map, including W. L. Lamborn and Jason Bolton north of Liberty Square, George Smith south of Liberty Square, and Edwin Shoemaker (Annie's father) in Chestnut Level next to Rev. L. C. Rutter. Tomorrow's post will feature a couple surprise discoveries about the album, but for now I'll just remark that the through this album we can see the Quaker community beginning to lose the cohesion as a sectarian(?) community that the Mennonites and Amish have more or less maintained to the present day. Wealth and education seemed to have begun to draw the younger generation of Quakers away from the simple farm life. Research on the album's younger Quakers shows many of them leaving Liberty Square for opportunities in cities (including Annie, whose family moved to Lancaster city) or the West and becoming much more liberal in their Quaker faith. Also, this appears to be the generation where traditional Quaker garb went out of style, as we can see a clear difference in dress between the older and younger generation of women. I'll have to ask my wife for a more thorough assessment of their fashion and wealth. Enjoy viewing the album, and check back tomorrow for the surprises to which I alluded earlier. A fellow Lancaster County expat in Pittsburgh (whom my wife and I have just so happened to sit next to at the church we've joined) just contacted me to recommend a book, _Liberty Square Observed and Noted_, which he read as his maternal grandparents attended Chestnut Level Presbyterian Church. It apparently reflects on life in Liberty Square in the mid-twentieth century, a potentially interesting companion to what we're learning about mid-nineteenth-century Liberty Square. Another update: One man pictured in the album and a couple of the other family members not pictured were granted conscientious objector status in 1862. Note that Aquila Lamborn's younger brother, William Lewis Lamborn (pictured in the album), joined Company E, 79th Pennsylvania, in September 1861.